Sponsored Post. All opinions expressed are honest. July is here! That means L.A Mamacitas had to get in the summer spirit by hosting a summer party. Hotel Transylvania 3: Summer Vacation is set to release on July 13th and it was the perfect opportunity to get together with some of favorite L.A mommy bloggers for a playdate. It was definitely a hot day in L.A but we took advantage of the colorful shaded area and the splash pad to cool off. The kids had a blast! 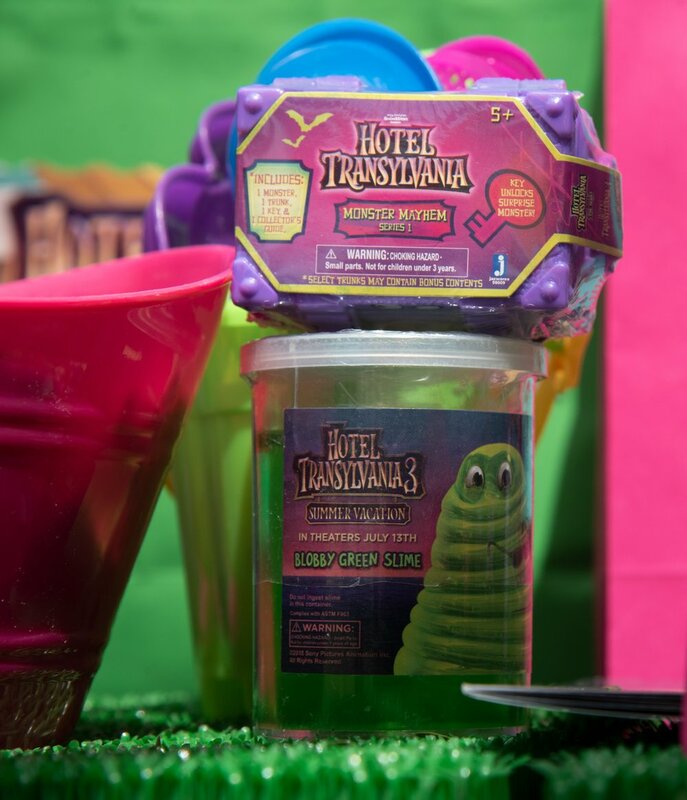 We have outlined the details of our Hotel Transylvania 3: Summer Vacation themed playdate so that you too can host one yourself! We set up a picnic area closer to Hill St. The park has an amazing colorful tent to provide shade to park guests. We kept the décor really simple but fun! Colorful mats, beach towels and bright pillows were the best way to go. You can also find plenty of hot pink chairs and tables around the park that you can use for your get together. Hot days call for cool food. Our guests enjoyed a variety of salads, fruit cups, chips and popsicles. We also provided candy treats like sour worms. Yum! The kids had a blast with Hotel Transylvania themed toys like Blobby slime, activity books, Monster Mayhem trunks and beach balls . They also cooled off at the splash pad adjacent to the grassy area at Grand Park. Join our favorite monster family as they embark on a vacation on a luxury monster cruise ship so Drac can take a summer vacation from providing everyone else's vacation at the hotel. It’s smooth sailing for Drac’s Pack as the monsters indulge in all of the shipboard fun the cruise has to offer, from monster volleyball to exotic excursions, and catching up on their moon tans. But the dream vacation turns into a nightmare when Mavis realizes Drac has fallen for the mysterious captain of the ship, Ericka, who hides a dangerous secret that could destroy all of monster kind. Follow us on Instagram to see more of our events!